In its bid to reposition the University towards attaining a world-class status through internationalisation, a team of Thailand and Vietnam Scientists on the European Union GRATITUDE Project Team, recently visited the University. Welcoming the scientists, the Vice-Chancellor, Prof. Olusola Oyewole, stated that the essence of research is to impact knowledge, urging them to ensure that they make the best out of their research efforts. He noted that the collaboration between FUNAAB and the GRATITUDE team was yielding results and pledged his support for any prospective exchange that will emanate from the collaboration between FUNAAB and the Universities in Thailand and Vietnam. Prof. Oyewole assured the scientists of their safety as they went round to visit some industries, farms and villages in Nigeria, while he thanked the duo of Prof. Lateef Sanni and Dr. Kola Adebayo, describing them as virile and committed scientists. 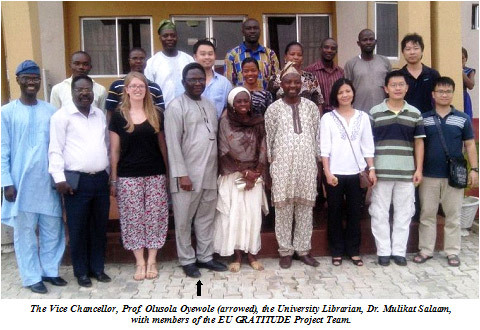 The GRATITUDE Research Fund is established under the EU-Sponsored ‘Project on Gains and Losses from Cassava and Yam’, with partners from the United Kingdom, The Netherlands, Portugal, Thailand, Vietnam, Ghana and Nigeria. Expressing his appreciation, Prof. Lateef Sanni stated that he was glad to be with the Thailand and Vietnam Scientists and expressed optimism that they could work together, especially, with those committed to the development of science, roots and tubers. He further explained that the team was also on industrial visit meant to establish South-South Cooperation. On the visiting team were Ruth Leavett, from the Natural Resource Institute (NRI), Tu Viet Phu, Ms. To Kim Anh and Chu Ky Son from the School of Biotechnology and Food Technology, Hanoi University of Science and Technology, Vietnam. Others include Jackapon Sunthomvarabhas and Sittichoke Wanlapatit from the National Science and Technology Development Agency (NSTDA). 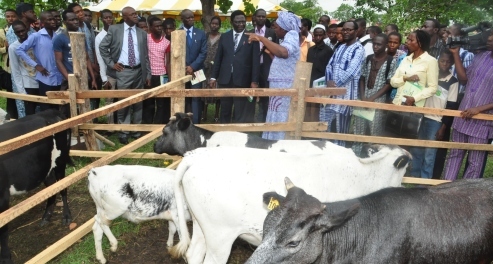 Also present were the University Librarian, Dr. (Mrs.) Mulikat Salaam and the Director, Institute of Food Security, Environmental Resources & Agricultural Research (IFSERAR), Prof. Akin Omotayo.